Although shingles are not complicated compared to other coverings, some accurate measurements and professional equipment will ensure your roofing placement is done in a proper manner, providing years of protection and a nice look to your home. 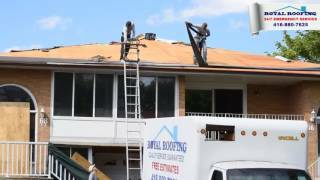 Royal Roofing is located in Toronto, ON and provides services to diverse clients, including residential homeowners and local businesses. Asphalt shingle placement is one of the most popular residential roofing solutions in Toronto. Within last 15 years, we've developed much experience working with this particular type of roofing. By installing architectural shingles on your roof, you will definitely make your house stand out. We will do whatever it takes to provide protection to shingles (installing a waterproof membrane layer, a breathable underlayment, metal flashings, drip edge protection, etc. ), and examine the wood surface to eliminate all kinds of imperfections, such as rotten fragments, parts affected by insects, etc. At this stage, we prepare the chimney area and seal the visible cracks around it. To ensure protection against leaks, we install 3-tab shingles so that they overlap each other by at least five inches. Although asphalt shingle manufacturers require at least 4 nails per shingle to provide wind protection, we normally suggest that our Toronto clients increase this number for better wind safety and extended placement warranties. Such an approach allows our clients to significantly reduce the maintenance costs. The leftovers, and minor debris and rubbish, are thoroughly picked up, sorted, and disposed accordingly to Toronto waste management requirements. If you're interested in shingle roof installation, call us 1-866-901-7534 (Toll-Free) to get an instant consultation and quote. When Is New Roofing Installation Needed? Although the average asphalt shingle lifespan ranges from 10 to 15 years, it is highly recommended to check the condition of your roof from time to time. With knowledge, it is easy to spot worn shingles before you actually risk letting moisture inside your home. Asphalt shingles will start to shrink and curl as they lose their protective layer. You can normally see it if you take a closer look at the bottom edges. When it comes to architectural shingles (other way known as dimensional, laminated, 3-D shingles), they will need a more thorough examination, since this kind of covering does not shrink noticeably. However, their worn surface will start to look shiny and have a glare to it, since its laminate layer being revealed due to the excessive wear of the top coating. When inspecting your roof surface, make sure you've checked all kinds of exposed items. These include loose or missing nails, broken or shrunk shingles. It is recommended to check the corroded metal details, including metal flashing, gutters, downspouts, etc. You should pay attention to the shingle texture and check excessive granule loss. To have your roof examined, hiring skillful roofing companies could be a great idea. If you need professional roofing placement services in Toronto, be sure to contact us to get the information you need from our certified technicians. After completing the tear-off process, our experienced roofers will inspect the decking of your roof for any damage. Soft spots or damage inside the sheathing are indicators that it needs to be replaced with a new one, however before the sheathing can be cut into, our contractors check for any wiring underneath it to avoid accidentally cutting your telephone or TV cables. If there is damage inside your roof’s sheathing, it is probably because of the violation of the roof seal, which tends to occur around skylights, chimneys, roof vents, etc. Our contractors cut the damaged area next to the rafters. They then nail wooden strips to the rafters’ edges. Exterior grade plywood is used during the replacement, and 1/8 of an inch is reserved for possible expansion on all sides. You should take extra caution to ensure that your contractor uses an under layers of felt paper, other way known, building paper. Most roofing companies in Toronto use this technique, since it provides extra protection against leakage and damage. Royal Roofing Inc. installs an additional protective layer called the “ice and water shield” or “ice guard”, which is beneficial for cities with a cold and unpredictable climate like Toronto. The ice and water shield is used in valleys, along the eaves and rake edges of the roof to ensure the highest possible level of protection. Some companies in the GTA avoid using this method to save money. You need to ensure that the ice and water shield is included in your estimate. Avoid dealing with companies, who refuse to provide the shield. Remember that Royal Roofing Inc. is at your service. A chalk line is used to represent the surface along which the shield is to be installed. Felt paper is applied and customized to fit the specifics of your roof. An extra drip edge is installed along the rake edge of your roof to protect your house from blowing rain. The seams around roof elements and adjoining surfaces need to be protected, which is why a metal of rubber barriers need to be installed in a process called flashing. The purpose of this is to lead the water off the roof and keep it away from the seams, which means that flashing is installed in areas, where shingles are prone to leaks or cannot be applied at all. This is why flashing, needs to be made custom for every roof. Sometimes the repairs you require on your roof may include changing or installing additional flashing for extra protection. Aluminum, galvanized steel or copper are the materials that make up metal flashings, which are an important component that ensures the longevity of your roof’s life. Our contractors use your old flashings as templates for new pieces. New flashing is then installed wherever necessary on the roof. Then the installation is made in the valley, to ensure that the water is guided off the roof. Most homeowners in Toronto and the rest of Canada prefer to use asphalt shingles (called composition shingles for their roof. This is based both on their performance and appearance. Asphalt shingles serve homeowners well during all types of climates, are available in a variety of colors, textures, shapes and can complement the design of any house. Moreover, asphalt shingles are the cheapest to repair and are durable. Common shingle type is the three tab, since it is visually appealing, durable and affordable. Felt paper is laid down prior to the installation of shingles. Shingles are then staggered to ensure superior protection against leaks. Shingles begin to be installed starting from the bottom of the roof. Shingles then continue to be installed in layers in accordance with the measurements (sometimes shingles need to be cut and customized to fit certain areas of the roof).